While Reading:Years into the future, our world has changed. Oceans have risen. Leaving the world to all but abandon Earth's once dry ground. High rises are the new normal. Politicians being the new king.Our MC, Aria, knows about all the ins and outs of politics, or at least she should. As part of the Rose family, Aria can trace her family line back generations. Each generation a helping hand to this altered city and its people. But that family prestige comes at a price. Believing that she has had a break down of sorts, Aria awakens to find that in a blink of an eye her life has changed. The family's once arch-rival in politics, the Fosters, have now become an ally... due to her pending nuptials with Thomas Foster. With gaps in her memory, a forbidden romance coming to light, and secrets that have been hidden for generations, Aria must get to the bottom of the lies if she ever hopes to have her true happily ever after.Part of my love for Mystic City was due in a large part to Aria being such an amazing character. I loved watching her progression as she came to terms with her memory loss. Having to rebuild everything she thought she knew about her life and family. The relationships that she had built changing over night. Leaving her confused and like a new born child. 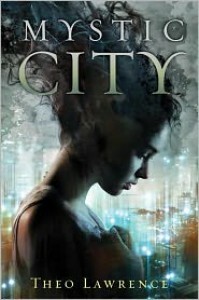 Her eyes finally open to the world around her and all its injustices.Mystic City blew me away. It went way beyond any expectations that I had for it. Initially, I was drawn to the idea of forbidden love, star-crossed lovers. The Roses and Fosters have been fighting generations. The thought that these two families could put aside years of fighting for their children's romance was astounding and seemed a little too good to be true. And it was. Completely not in the way I was expecting either.Final Verdict:There was such much that I loved about Mystic City. The characters. The politics. The romance. And I never even got to mention the Mystics themselves. But that was largely due to me wanting to leave much of the story a surprise... because you have to read this one.Sure, Mystic City is not 100% perfect. I did have a bit of an issue with the romance of Aria and a certain someone feeling a little off. But that is a small issue in the big picture. Although, this is the start to a series, Mystic City has a solid feeling ending. No cliffhanger. No big, bad thing looming in the distance. Mystic City feels like it could easily have been a standalone. And I would not have been disappointed if it was, but I am excited to see what happens next.